Hanlon Windows Australia Pty Ltd was first established in 1979 by Brian and Judy Hanlon. Their vision was to set up a small family business in the Shoalhaven. Brian and Judy initiated this small family business from a two car garage in Shoalhaven Heads as a re-seller of Aluminium Windows and Doors. With Brian being a Carpenter by trade and having greater industry knowledge, this small family business soon became a growing success. Hanlon Windows Australia Pty Ltd has now moved into a second generation family business with Brian and Judy’s son Chance Hanlon taking on the role of Managing Director, overseeing the group of companies. Chance has now moved on and taken over the company in 2013 becoming Managing Director and Owner. Chance Hanlon has been involved with the company now for over thirty years and has an extensive back ground within the business. Chance initially started in the factory then moved into Sales and Accounts. His passion for the business continued to blossom as he stepped up into a larger role of running the Wollongong branch for seven years and then a Production Manager for four years. This experience has given him the knowledge and experience to fulfil the position he is in today. 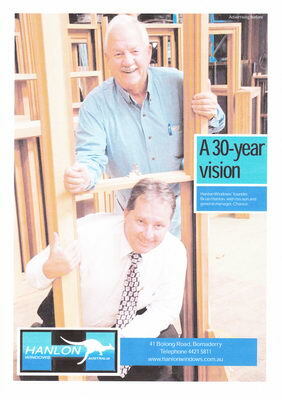 Hanlon Windows Australia now has three successful branches based throughout NSW. Hanlon Windows head office is based in Bomaderry where all Windows and Doors are manufactured and dispatched. The other branches are located in Sydney and Wollongong, both have great sales teams that are on hand to assist with all your Aluminium and Timber Window and Door needs. Hanlon Windows also supplies to the Far South Coast, Canberra and Southern Highlands areas. Committed to continuous improvement and constant refinement, Hanlon Windows have a goal to establish new standards in the performance, appearance and quality of their Aluminium and Timber Windows and Doors. Hanlon Windows today make a diverse range of Aluminium and Timber Windows and Doors and currently employ approximately 85 employees. We pride ourselves in supporting many local charities, community projects, sporting associations and families throughout the Southern NSW Region.